Moist cooking methods are those methods that use a hot liquid to cook food. That liquid can be water, broth, wine or juice. Unlike dry cooking methods like roasting or baking, which use hot air to cook food, moist cooking methods preserve and even add moisture to the food as it is cooking. This property makes these cooking methods especially appropriate for food that needs softening, for example, hard vegetables, tough meat or dry grains and beans. 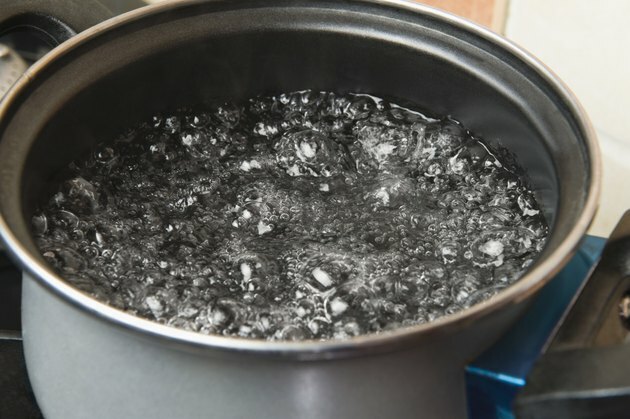 Boiling involves cooking food in water or other liquids that have been heated to their boiling point. Boiling is one of the most aggressive of moist heat cooking methods and is most appropriate for hard, dry foods like whole dry grains or beans. Boiling also kills most bacteria that inhabit foods. The boiling point of water at sea level is 212 degrees Fahrenheit. However, at 2,000 feet the boiling point is 208 F, and at 5000 feet it is 203 F. The difference can affect not only in the amount of time food takes to cook but also the speed at which bacteria are killed. Simmering involves cooking food at a temperature just below a boil. The bubbles in the cooking liquid are not large and rolling like they are during a boil, but rather are small and break the surface of the liquid a few at a time. Simmering is appropriate for foods that are soft but not delicate. Vegetables like peas, corn and potatoes can be simmered. Sauces that would burn if boiled can also be simmered. Poaching involves cooking foods in liquid heated to 160 to 185 degrees Fahrenheit. Bubbles don't form in the liquid at that temperature, so poaching is suitable for delicate foods that would be damaged by the movement of the water were they to be boiled or simmered. Thus, poaching is suitable for eggs and delicate fish. Steaming involves cooking food over a liquid that is heated to a temperature high enough to generate steam. Specially made steamers have holes in the bottom and sides that enable the cook to lift the food out of the water in the bottom of the pan. The lid of the pan traps the steam, creating a hot, moist environment, which cooks the food. Steaming is ideal not only for delicate foods like steamed breads, it also maintains the nutrition of vegetables, which can lose vitamins to the water in which they are cooked. Braising is a hybrid cooking method. Foods are first browned in oil to caramelize the sugars and enhance flavor. Then, a small amount of liquid is added to the food, enough to generate moist heat but not enough to cover the food. The liquid is brought to a low simmer, roughly simmering or poaching temperature. A cover is added to the cooking pot. The steam builds inside. The food steams and poaches slowly, softening hard vegetables and tenderizing tough cuts of meat.